As the Herald switches to tabloid, The Daily Telegraph goes even more tabloid. Last Tuesday the Telegraph sank below all precedents, adorning their front page with the announcement that Communications Minister Stephen Conroy had joined the ranks of the world’s harshest dictators: Stalin, Castro, Mao, Kim Jong-Un, Mugabe, and Ahmadinejad. This was apparently what Telegraph reporters had taken from a press conference held by the Minister, giving details about the Government’s response to last year’s media ethics inquiries (the Convergence Review and Finkelstein Inquiry). 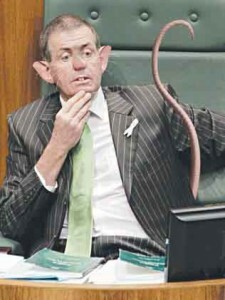 When the straws were drawn to front up to an interview with 7:30, News Ltd Director Campbell Reid must have drawn short. Unblinking in the face of a classic Leigh Sales performance, Reid defended the front page as deliberately ‘provocative’, in keeping with the paper’s tabloid style. The Telegraph’s delicate sensibilities have been offended by legislation that would, among other things, appoint a Public Interest Media Advocate (PIMA). The advocate would apply a public interest test to proposed media business mergers and monitor the effective functioning of self-regulating print standards bodies. “The advocate would oversee the Press Council, the main vehicle for complaints about the print media, and could take back exemptions from privacy laws afforded to journalists to report valid news stories,” their front page read. While the Press Council would have to declare itself to the advocate (government), it would only be to ensure functionality: that it reflected community standards of news and current affairs, had an appropriate complaints handling system, arrangements to publish decisions and apologies, and operated with a sustainable funding model. 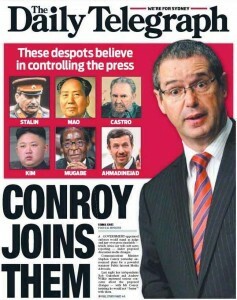 Conroy has unequivocally denied the claims of second world censorship. “[The legislation] keeps the government out of print regulation, and the government will not fund or oversee press standards bodies. They will be run, funded and overseen by the industry itself.” While it’s no guarantee of absolute separation from media regulation, it probably couldn’t have been more transparent: this is not an attack on ‘free’ (read: journalists’) speech. Yet Telegraph reporters conveniently missed Conroy’s quote in their copy, and his assertion that exemptions from the privacy laws would still be available. The real teeth of the PIMA would be in the approval of media mergers to ensure diversity of news voices and mitigate the tendencies of certain parent news companies to monopolise multiple media platforms. Something the Telegraph should know all about, with Daddy (News Ltd.) owning what is thought to be around 70% of newspapers produced in cities across Australia. Self interest aside, Reid did raise an interesting point: “I challenge the Prime Minister to give a specific example … of where free regulation and self-regulation [has] broken down.” And it’s true: Australia’s regulatory system has not shown the same level of incompetence as the British News of the World / Jimmy Saville ethics scandal which prompted last year’s media inquiries. This aside, the proposed legislation appears tokenistic; a nod toward the previous year’s attempts to localise the issues brought up with News of the World. Conroy has given parliament just two weeks to push through the legislation, a move most have interpreted as revealing the government’s lack of confidence in it passing. So the Tele can breathe easy: ‘valid’ news stories will remain untouched, and hyperbole—the refuge of the ignorant—will remain firmly in the paper’s daily repertoire.